Equinox Egg Balance Science - Is It Really Easier on the Equinox? Home » Science Notes Posts » How Stuff Works » Equinox Egg Balance Science – Is It Really Easier on the Equinox? Equinox Egg Balance Science – Is It Really Easier on the Equinox? According to a popular urban legend, it’s only possible to balance an egg on end on the equinox. The equinox occurs twice a year, with the spring or vernal equinox falling around March 20 and the fall or autumnal equinox occurring around September 22. On these two days of the year the length of day and night are about the same. The practice of balancing eggs on the equinox may trace its roots back to Chinese culture. Eggs, a symbol of fertility and rebirth most often associated with spring celebrations (like Easter) could be balanced as a sign of natural harmony. On the equinox, day and night balance, rebirth follows a period of winter stillness… you get the picture. People who believe it’s only possible to balance an egg on the equinox or else think it’s somehow easier to balance an egg on either of these special dates attribute the effect to the celestial alignment of the Earth’s equator with respect to the Sun and plane of the solar system. In fact, the effect of the equinox on gravity or electromagnetic forces is much less significant than any air currents in a room or even the breathing and heartbeat of a person attempting to balance an egg. 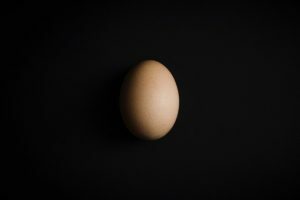 In 1947, Japanese physicist Ukichiro Nakaya performed an experiment demonstrating it’s possible to balance an egg any time of the year and not any easier on the vernal or autumnal equinox. He explained that the bumps and dimples in the egg’s surface touch a flat surface at enough points to support the egg’s center of mass. Nakaya’s experiment was replicated in 1984 by University of Minnesota astronomer Frank D. Ghigo. Ghigo balanced eggs on their large ends on a Formica table every day from February 27 to April 3, 1984. That year, the spring equinox occurred on March 20. For the study, he used four samples of one dozen eggs each. Some of the eggs could be balanced nearly every day. He was incapable of balancing other eggs, on the equinox or any other day. He also noted balancing eggs was much harder if the balancer was nervous, impatient, or shaky. If you want to balance an egg, on the equinox or any other day of the year, choose a level surface. If the surface is sloped, the egg will roll. Inspect your eggs and select one that has tiny bumps or imperfections on its larger end. Ideally, you want at least three little bumps to act as a sort of egg tripod. It’s also easier to balance an egg if its wide end is noticeably fatter than its narrow end. Make certain the room is free of vibrations and air currents. In other words, don’t try to balance an egg in a room with an open window or right beneath an air conditioning vent. Balancing an egg takes practice and a steady hand. Several attempts may be required to achieve success. If you have trouble, try a different egg. If you absolutely can’t balance the egg, cheat a bit and put a tiny bit of salt under the egg for support!